PachaMama is a natural sanctuary for the soul; a spiritual community united in the intention to live a life of reverence, meditation and harmony with nature and the elements. 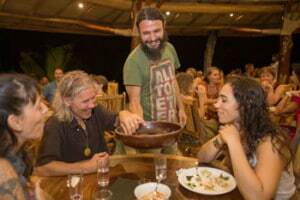 Located on the Pacific coast of Costa Rica in a forested valley, PachaMama was founded in 1999 by Tyohar and a cluster of fellow travelers, following a vision to manifest an intentional community, embracing an alternative way of life. Since it was founded, the village has become an international gathering place, a colorful and unique energy field comprised of diverse personal and cultural backgrounds. 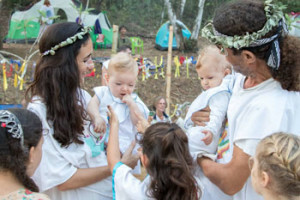 PachaMama is both a spiritual community for residents who have made it their home and a nonprofit center of transformation that offers retreats and workshops to hundreds of visitors every year. All income is reinvested to support the operation, maintenance and growth of the village. The community also has a pre-school, Kindergarten and primary years schooling program to service the growing number of children born in the village as well as the families that have joined it. As an eco-village, PachaMama continuously creates projects to increase biodiversity and sustainability, and to minimize its carbon footprint. The principles of permaculture, waste reduction, soil regeneration, water retention and recycling, to name but a few, are explored and applied in the village. PachaMama is totally committed to providing nourishing healthy food that is kind not only to the body but to the Earth as well. Superfoods, fruits and leafy greens grown in the village are 100% organic and the community works in partnership with and supports local farmers using responsible growing practices. The community of PachaMama is unique among communities in Costa Rica. It allows each and every one to live with authenticity, close to nature and in harmony with the cycles of silence, meditation and celebration. What unites the village is the shared journey of awareness- a meeting of individuals beyond personalities and ideas. The intention to live a conscious life, looking into the mirror of one’s true self, is what binds the community together. Yoga, meditation and sacred Native healing ceremonies are key to the soul of PachaMama, much more than mere lifestyle choices but rather deep-rooted commitments to the nature of this unique place.